I am not a big fan of Mushrooms.Of course there are a few recipes I love which features Mushrooms,but you know,if I did not have it for a long time,I wouldn't miss it as much.But when I saw this recipe over at Arundati's place,it seemed as if it called out to me.The recipe remained in my Bookmarked folders for a long long time.Finally I decided to make it and see if it evoked any mushroom love in me. Any recipe which is named Biryani makes me alert.As some say,there can only be Mutton Biryani,everything else is a mixed rice.Though I do not agree to that,it is tough to convince my non-veg loving husband regarding the same. I was intrigued by the method of preparation.Marinating the mushrooms first and then cooking it along with the rice in an open pan.I've made Biryani in a pressure cooker and a rice cooker but never like this.The resulting dish however,is a cracker.First up,the rice grains look so pretty,retaining the shape and cooked perfectly.The flavor of mushroom is mild and it almost smells like a non-veg biryani-yes! (in a nice way though)Got a thumbs up from Ajay and I do not have to think twice about what I am preparing for the next potluck! 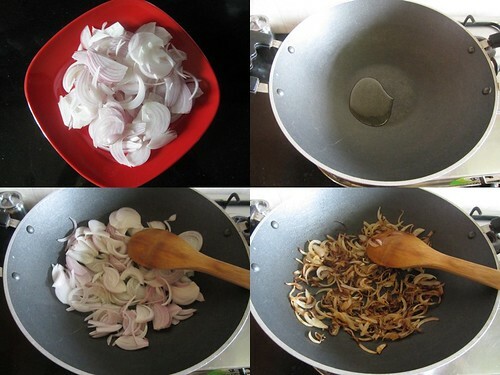 In a thick bottomed kadai add 2 tbsp oil and fry the onions in it till dark brown and crispy.You could also deep fry the same. Wash and soak the rice in 2 cups of water for 30 minutes. 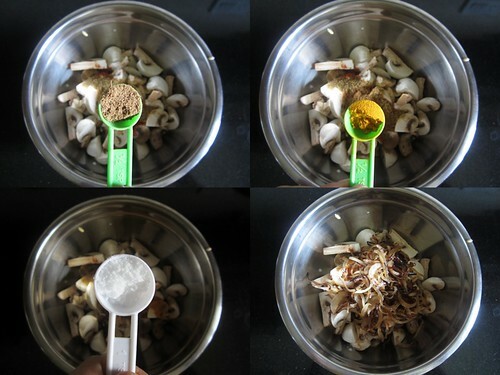 Marinate the mushrooms in ingredients mentioned under marinade along with half of the fried onions. 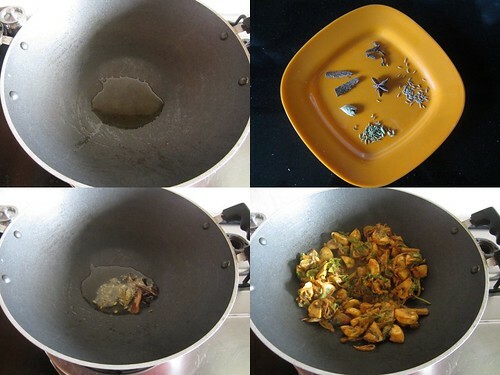 In a kadai add oil+ghee and saute the whole garam masala followed by shahjeera and fennel seeds. 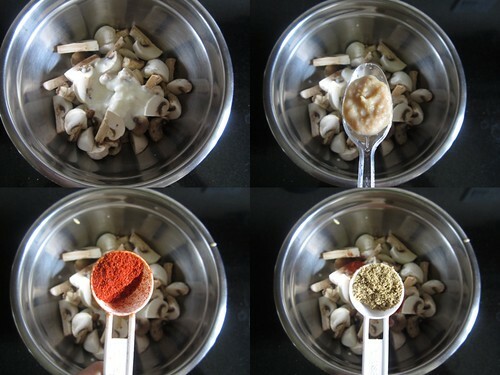 Add the marinated mushrooms along with the marinade and cook for 5-7 minutes or till the mushrooms start shrinking. Mix in the coconut milk and let it cook for another 3-4 minutes. Drain the rice(reserve the water) and mix in carefully trying not to break the grains.Add in salt to taste and 1/2 tsp of garam masala. 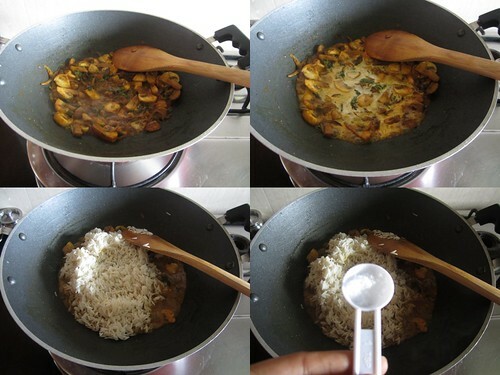 Add the water in which the rice was soaked* and let it boil.Cover with a lid and cook for 15 minutes.The water should be fully absorbed by now. Switch off the flame and leave it undisturbed for another 15 minutes. 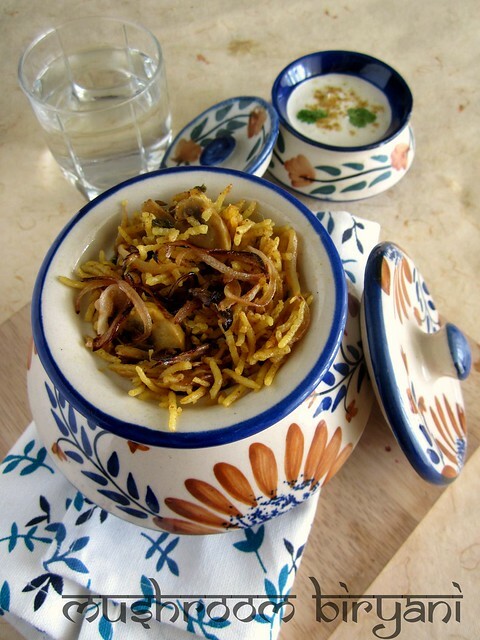 Open the lid and fluff the rice with a fork.Mix in the rest of the fried onions and serve. 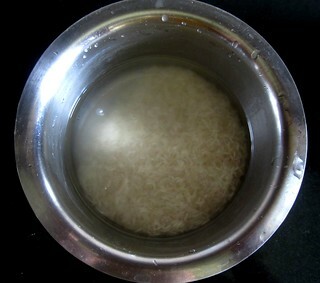 *I have used 2 cups of water to cook 1 cup of rice.The rice was perfectly cooked with grains not sticking to each other.I usually follow the same quantity when I cook in the pressure cooker too for one whistle.But it usually depends on the kind of the rice you are using.So follow the method depending on the rice you use. 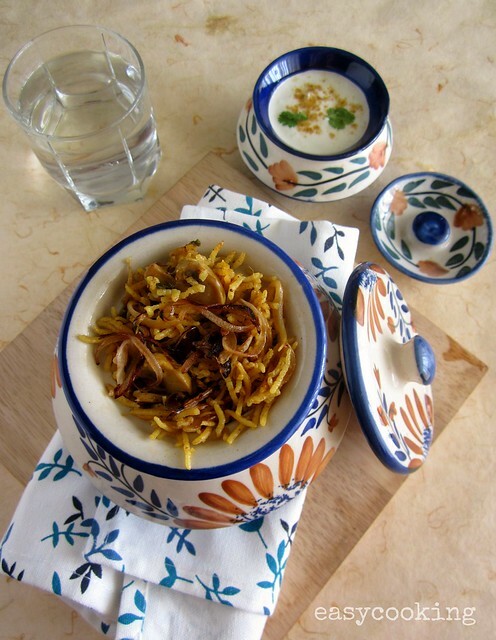 The Biryani tastes delicious on its own,so I served it with some spiced raita flavored with salt and jeera powder. 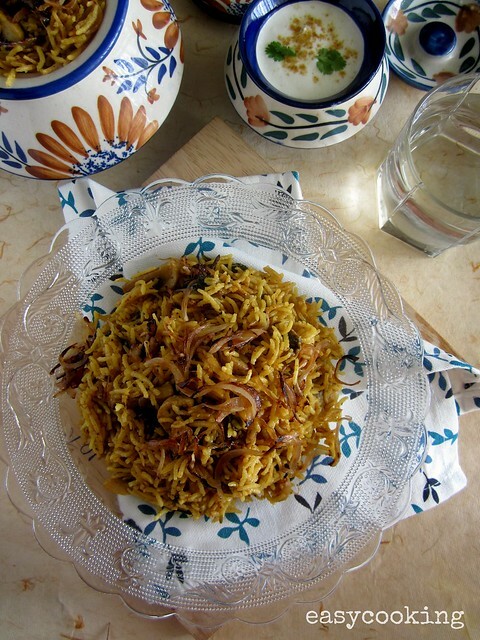 Mashroom biriyani looks so delicious and yummy..
Aromatic and flavourful biriyani..bookmarked the recipe!! 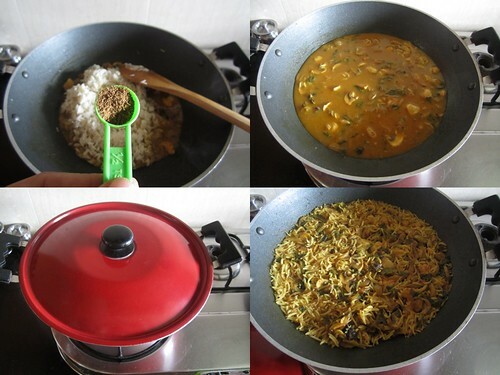 awesome biriyani..i tried this way n it came out well...Thanks for sharing!! Tried this recipe..turned out yummy..just added green chillies after frying spices in oil just bcoz i dont want to add too much chilli powder..thank you so much for sharing!! Very tasty -- this amply fulfilled my craving for mushroom biryani. Thanks for sharing! I tried out this recipe today.. turned out super tasty.. a quick recipe i was done in 30 mins.... i didnt have any cilantro and mint in hand.. but still it came out wonderful.. thanks for sharing the recipe. Loved your recipe. My husband enjoyed it thoroughly.loved every moment of him enjoying my dish. Thanks for ur recipe.It turned out delicious..